Description: The high sensitivity of polarized light scattered by suspended particles to the properties of these particles has successfully been exploited during the last 40+ years to obtain unique information of aerosols in planetary atmospheres from polarimetry. In addition, promising results have been obtained regarding the sensitivity of polarimetric observations to the properties of marine particulates. This has led to the consideration of adding a polarimeter to the PACE mission. Here, we discuss 3 types of polarization studies performed for this mission. Firstly, recent improvements in polarimetric measurement accuracy have necessitated matching improvements in the simulation accuracy for upwelling polarized light in atmosphere-ocean systems (AOS). We computed and compared the polarized light just above the ocean surface and at the top of the atmosphere using several numerical codes for different viewing angles, wavelengths, and AOS models. We report on the results of these comparisons. Secondly, we used forward radiative transfer computations to investigate the sensitivity of polarized light emerging from the top of the atmosphere to variations in the scattering properties of open oceans. We also used statistical inversion techniques to investigate the information content of this light on atmospheric and oceanic properties as a function of the number of wavelengths, of viewing angles, and of the polarimetric measurement accuracy. We summarize the results of both sensitivity studies. Thirdly, we obtained airborne multi-angle and multi-spectral polarization observations of light from a high altitude aircraft over the west coast of California. 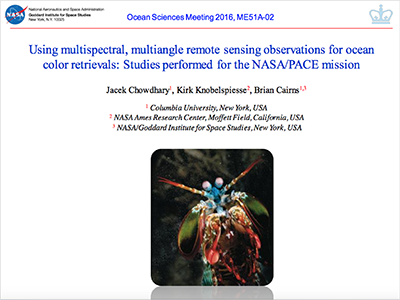 We performed inversions of these measurements to obtain the spectrum of the ocean color remote sensing reflectance, and compared this with concurrent radiance measurements obtained from a boat. We briefly describe our inversion algorithm and show preliminary results and validation of our ocean color estimates.